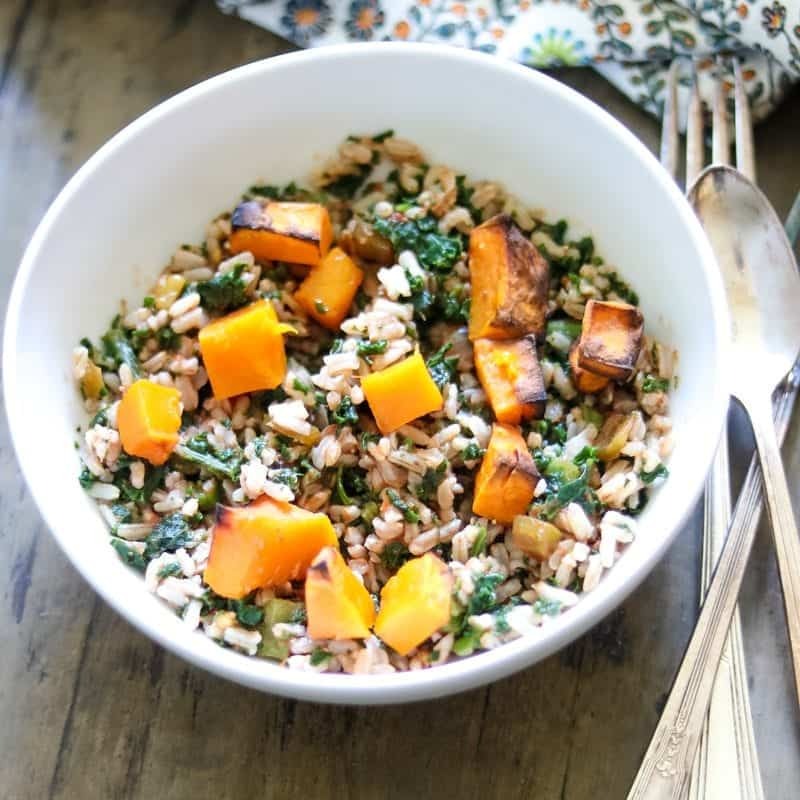 Vegan Butternut Squash Rice Bowl: A hearty rice dish made with Kale, butternut squash and southwestern seasonings. This dish stared out as a no frills, desperate for lunch and not much in the house kind of meal. Oh you know you have been there before. For me, I found myself at home alone for the day with little left in my kitchen. I had cleaned it out packing the rest of my family lunches that morning. And in my whirlwind of trying to catch up on laundry and housework, I found myself with my stomach growling loudly before I had time to hit the grocery store. I looked around and got creative with what I had lying around. A bit of roasted butternut squash after making my Harvest Quinoa Salad, some pretty wilted kale, and a half a jar of salsa. Hmm…..if you added that to some pre-cooked rice in that I keep in the freezer at all times, I would tame the the wild bear that my stomach had turned into. So I defrosted the rice and threw in the salsa, the squash, kale and some seasonings and heated through. This Tex Mex Rice Bowl was so comforting and filling! To me, I always enjoy good Mexican food, but this dish was unexpected for me. The pairing of the sweet roasted squash, with the spicy salsa and hearty rice was just perfection. This was not just a tasty dish, but an EASY and HEALTHY dish as well. I devoured my serving quickly and was already looking forward to having leftovers the next day. Well, I have one for you, but I don’t want it to limit you. If you have spinach instead of kale, use that! If you have sweet potatoes instead of butternut squash, that would work as well. Want to roll it in a burrito? I think that is a GREAT idea! Don’t have salsa–use diced tomatoes with green chiles. If you happen to be like me, and have pre-cooked rice and already roasted squash–just mix together 2 cups brown rice, 2 cups roasted butternut squash, 1 cup salsa, 1 cup fresh chopped kale and 2 teaspoons homemade taco seasoning. Heat in microwave for 5-7 minutes until heated through. Dinner done in less than 10 minutes!! I love to use a blend of lentils, quinoa and rice in place of plain brown rice—just an extra dose of protein and still is Gluten-Free. But plain rice, quinoa or all lentils work as well! Just adjust cooking time based on your grain. What if you don’t have rice in the freezer? Bring 2 cups of water. 1 tablespoon Homemade Taco Seasoning and 1 cup of salsa to a boil. Add in 1 cup brown rice. Simmer until tender, about 50 minutes. Throw in fresh kale at the end to wilt. If using frozen Kale add to boiling stock when you add rice. If you aren’t vegan, this is great topped with feta or sharp cheddar cheese. 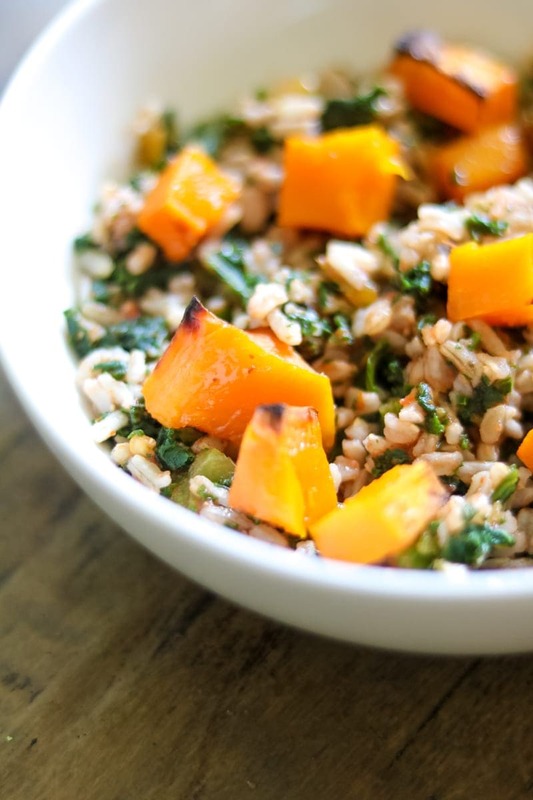 A hearty rice dish made with Kale, butternut squash and southwestern seasonings. Combine stock, salsa, and taco seasoning together and bring to a boil. Add in rice or quinoa and lower to simmer and cook until grain is tender, about 50 minutes. Stir in butternut squahs fresh kale and let wilt before serving. To Roast Butternut Squahs: Cube 1 squash in 1 inch cubes and toss in 2 teaspoons oil. Roast at 400 degrees for 40 minutes, or until browned and fork tender. Looks so satisfying — amazing what you can come up with in a pinch! This was perfect with an avocado sliced on top and some feta crumbles.. I used Mango salsa because it’s all I had on hand but a spicier, more savory salsa would have been preferable. Thanks!! I love simple bowls like this – what most of my lunches look like! adding salsa is a great idea! The salsa really kicks it up a few notches and means less work for me–less seasonings and there are already chopped onions and peppers in the salsa! This looks amazing! I love it when something like this comes together from leftovers or whatever is on hand. PS – brilliant idea to keep rice stashed in the freezer! Thanks Patricia. Having the rice on hand helps me on so many busy days! I hate when those moments happen and you left with ‘everything in the sink’ type lunches but not when a gem is born. This rice bowl looks right up my alley! Love it! I love that you came up with this so quickly! It looks delicious and so comforting yet healthy! Healthy, easy and I bet super delicious. Right up my alley this dish is. I think like you suggested, in a burrito it would be also superb! Sometimes you just need a quick meal–it helps this one is tasty and healthy! This is my kind of lunch! Now if only I could be this creative when throwing things together and actually have them turn out as delicious as this looks…some day hopefully! Sometimes simple is truly best! I love butternut squash and kale together! This bowl looks amazing. Thank you so much Lindsay! It is a great combo for sure. Ha! Glad I am not alone! I know, sometimes they are the best meals! This is my kind of comfort food! Thank you so much for sharing your healthy and delectable Vegan Butternut Squash Rice Bowl with us at the Healthy, Happy, Green and Natural Party Blog Hop. I’m pinning and sharing! This looks like a great, simple recipe. Did you add any liquid to this to help the kale wilt? Thanks Lee Ann. Kale naturally has lots of water, so just like spinach, it will release quite a bit of liquid and wilt without the addition of any more liquid.